Some you know already. Some you've never heard of. But this year, it's very likely they'll be part of your lives from January to December. They're the new kids-on-the-block; ready to blow anytime from now. For over a dozen months, he remained inactive; with no idea of the way forward after the organisers of West Africa Idols failed to fulfil their obligations to him. But the winner of the first ever WA Idols soon took his future into his hands and headed to the studio. His numerous sessions with Cobhams are already bearing fruit. And in late 2008, he blessed us with the first single off his forthcoming debut album. We thought rapping in Yoruba language was the exclusive preserve of Lord of Ajasa and his clan. Until Dagrin raised his hands and stepped forward. The young rapper comes so correct, spitting his native Yoruba lines in such a manner that even if you don't understand the language, the poetry still leaps at you nonetheless. From his own single Ponponpon to collabos with KSB (turn me around) and YQ (e fimile), Grin has given us reasons to take him seriously. He didn't do well when he entered for the Star Quest talent hunt in 2006. But singer Pheel has continued to grow his art. Two years later, while some of his mates have fallen by the road side, he's still trudging on; armed with collaborations with Dare (Let you know) and Kel. And now, he's signed on to Cobhams Asuquo's production company; getting ready to work on his debut album. Have you seen DIPP perform? I mean, have you seen him on stage, performing his song dangerous and combining Michael Jackson-P-square-Usher dance routines? Oh, you've not? Sorry. But you must have seen his video for the said song. Dude kills it completely; making sure you notice and pay attention to him. Whether you want to love him for what he does; or you want to label him a P-square-Usher-MJ wannabe, it'll be difficult not to notice the young man. We'll expect his album this year. Plus, a few more gigs and videos will clearly tell whether he's his own man, or he's just, ehm, I know, a wanna be! Last year, we didn't see him lurking around. And he didn't ask for permission before he started creating his own hits, making nice videos and winning awards. So this year, it'll be nice to place the H-Man under watch - since we're unsure of what he'll be cooking this time around. With three vids already on air (ndoli ndoli, scared of love and h-man party), and over a dozen brand new cuts, the singer is ready to debut. And, what's this we hear of wedding bells? Good Lord, his voice! The dancehall cat is a breathe of fresh air, at a time when the custodians of the genre in Nigeria were suffocating us all with mediocre materials. And if you've heard him working with Niyola, MI, Loose Kanyon, or seen him on the rested Advance Warning show on MTV, you'll be left with no doubt the guy has come to fill a vacuum. Until a few months ago, he was just one of the numerous aspiring musicians scattered across the country. But all that has since changed: Iyanya Mbuk, an indigene of Cross Rivers state is now on his way to the world of fame and fortune. He got the one-way ticket after 10 grueling weeks, slugging it out with nine other equally talented contestants at the Project Fame house in Lagos. He's already teamed up with producer, TY Mix (one of the judges on the show) as work begins on his album. Hopefully, it won't be long before he starts rubbing shoulders with the industry's heavyweights. The singer had only one song to convince us of his musical prowess. And he killed it on Slow slow, his debut solo single that rocked radio for weeks and highlighted the similarities between him and Mo Hits' Wande Coal. You can't help but fall in love with the singer's voice and delivery. And no, he's not a Wande Coal wannabe. We can actually confirm that both singers were bandmates before Coal left to join the Mo Hits' crew. Watch out the Slow slow video this year. And if they want to make it more interesting, why not give us a Chuddy K-Wande Coal collabo? Yeah, you know her from Idols West Africa! Don't worry; the singer hasn't called it quits. Instead, Miss Megbele has been busy gathering materials that'll propel her further down stardomville. Her new songs In the music and Miss my baby are spreading fast, her video is getting ready to hit the TV, and she's warming up to hit the stage again. To ignore the daring singer in 2009 may be one task that'll prove impossible. 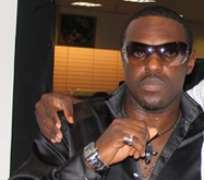 And finally, Nollywood bad boy Jim Iyke will go the way of Omotola, Genevieve, Nkem Owoh and Ramsey Nouah as he tests his skills on the mic in 2009. The popular actor has told friends he's putting together a rap album that'll be released in 2009. Will he come out so good or we'll lavish him with props? Or will he-just like Genevieve- deliver embarrassing materials only fit for LAWMA trucks?